UK Independence Party (UKIP) leader Nigel Farage will tell EU leaders on Wednesday that Europe’s proposed policy response to the heightening Mediterranean migrant crisis poses a “direct threat” to civilization. Ramping up his anti-immigration rhetoric in advance of Britain’s general election, Farage will make the pronouncement during a European Parliament (EP) debate in Strasbourg. The UKIP leader is expected to directly challenge European Commission (EC) President Jean-Claude Juncker about the EU’s cross-border response to a recent series of migrant boat catastrophes. The EU is reviewing its asylum policy, after more than a thousand migrants fleeing North Africa drowned in the Mediterranean Sea this month. However, Farage strongly opposes the concept of Britain joining EU-wide rescue operations despite the worsening crisis. Addressing EU leaders on Wednesday, Farage will warn that proposed changes to Europe’s asylum policy could pave the way for half a million Islamic extremists to enter Britain through Europe. The UKIP chief will also claim that a hasty policy shift would prove “wholly unacceptable” for Britain, which is already burdened with high immigration figures. 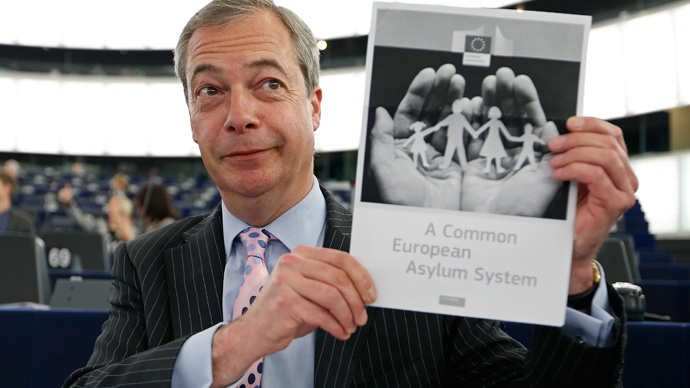 Farage previously argued millions of African migrants could make their way to Britain if the EU pushes ahead with proposed asylum policy reforms. Controversially, he suggested Britain could take some refugees as long as they are Christians. Wednesday's trip to Strasbourg will prove a change of scenery for the UKIP leader, who has been heavily engaged in Britain’s general election campaign race and is expected to win a seat in the constituency of South Thanet. Farage's intervention at the EP debate will be interpreted by some as a strategic ploy to gain publicity as the spotlight remains on election favorites David Cameron and Ed Miliband. Critics have long argued UKIP’s general election rhetoric is designed to stir up fear in Britain’s electorate. Farage was previously accused of employing “shock and awe” tactics during last month’s seven-way leaders’ debate after he expressed strong opposition to treating HIV positive migrants using public UK funds. Wednesday’s debate on EU asylum policy follows a series of protests in Britain last week, highlighting the sheer scale of the Mediterranean migrant crisis. The demonstrations were sparked after 800 people, who were fleeing violence and unrest in Libya and other states, drowned attempting to make their way to Europe. In a particularly powerful act of protest, human rights campaigners laid out hundreds of body bags on Brighton beach to highlight Britain’s “shameful response” to the crisis. The spectacle was organized by Amnesty International UK in an effort to increase pressure on the British government to play its part in protecting vulnerable migrants who flee their homelands in search of a better life. Since January 2015, at least 1,700 men, women and children have drowned in Mediterranean waters. This figure marks a dramatic 100-fold increase on 2014. Many migrants ferried across the Mediterranean are thought to be from war-torn Syria and sub-Saharan regions of Africa. As many as one million people from these territories are currently waiting in Libya to cross Mediterranean waters into Europe, Italian officials said last week. Earlier this week, opposition Labour Party leader Ed Miliband suggested the recent migrant boat tragedy could have been avoided if Prime Minister David Cameron had committed long-term support to the Libyan state following the ousting of Colonel Gaddafi. His allegation sparked outrage from Conservative quarters, with the party demanding he apologize for his “outrageous and disgraceful” comments.